What is Gary Sheffield doing? (A) Covering up his little-kid braces, whatever it takes. (B) Averting the slide of the silent member of the Bash Brothers. (C) Doing something literally that his uncle Dwight Gooden did figuratively a few times every day, usually in an alley. (D) Showing off his bulge to the fans on the second deck. 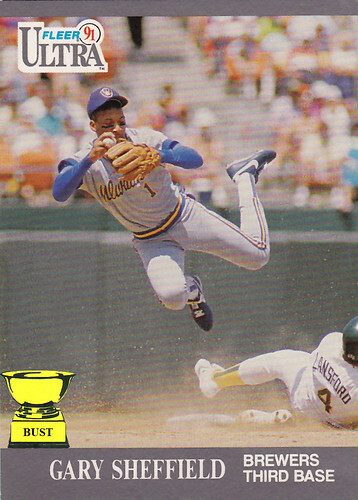 (E) Demonstrating the "ultraness" of Fleer Ultra. (F) All of the above. Looks like he fell asleep mid-dive.